A Seattle must-do during the summer and early fall involves a short boat ride across the Puget Sound with Argosy Cruises Tillicum Excursion to Blake Island. Guests are treated to a traditionally prepared dinner, Northwest Native American storytelling, a live performance, and handcrafted art—all inside a cedar longhouse surrounded by lush forest and rocky beaches. From an infamously bold population of photogenic raccoons to knowing what to call the clothing worn by Native Americans, read on for more on this unique experience from a couple of insiders. Cameron Quinn and Christopher Frank are cruise directors for the Tillicum Excursion, each with a unique background well-suited for the job. Quinn was born and raised around the shores of the Salish Sea (the body of water that encompasses Puget Sound and two other straits, as well as their connecting channels and adjoining waters) He studied a combination of creative writing, music, theater and anthropology at Western Washington University. "I feel a close kinship with the lands and waters of the Pacific Northwest and have worked for nearly a decade as an environmental and cultural educator in the Pacific Northwest," he said. Frank has been with Argosy for eight years, starting as a dancer in the program before moving over to cruise directing three years ago. 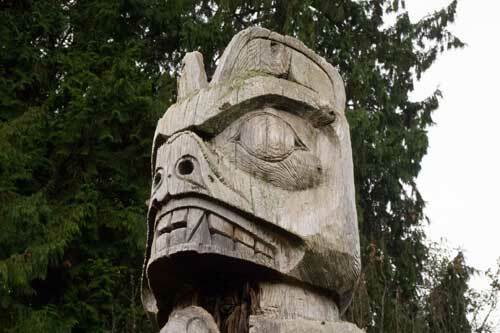 He's of Native American heritage, being a member of the Haida tribe. "My great-great-grandfather was a carver of some renown: John Wallace, or Saaduuts. Although I do not carve myself, I have a great appreciation for the role the arts play in the indigenous communities of the area," said Frank. Quinn: Argosy invites each Tillicum "Cruise Director" to shape the narrations based on our personal research and expertise, as well as the dynamic experience the waters provide; every journey offers something new to discover. Tours tend to emphasize the unique ecology of the area and how intricately intertwined it is with the cultures that have developed here for well over ten thousand years. The first nations to live along the shores predated the growth of towering cedars and the abundant runs of salmon that worked their way north on the tail of the last ice age, so the cultures that personify this region today literally grew alongside the resources that define them. Frank: As a cruise director, I am focused on the guest experience. As the guests board, I will make my way around the boat and greet guests as I can. I am always interested to find out where they are from, and answer any questions. Once we leave the dock, I provide a narration on the 45-minute cruise to Blake Island. I try to focus on the anthropology/archeology, history and mythology of the local area, as it relates to the native communities. 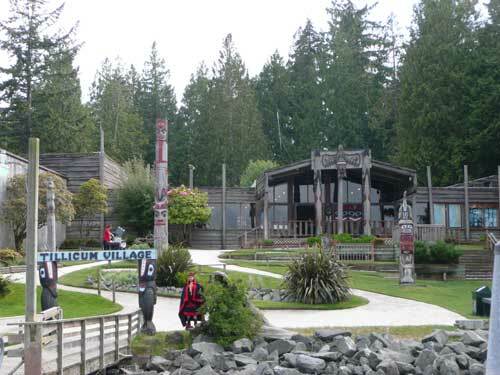 I hope to provide a framework with which to better appreciate the Tillicum Village experience. Quinn: In addition to the potential wildlife sightings, a clear day will offer the opportunity to see our two mountain ranges—the Olympics and the Cascades—and up to three of Washington's five active volcanoes: Mt Baker, Glacier Peak and Mt Rainier. The route also offers an ideal photo opportunity of the Alki Point Lighthouse and picturesque panoramas of the downtown Seattle skyline. 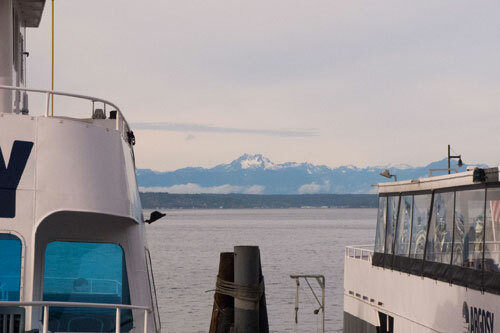 Frank: As we depart, you get to see the hustle and bustle of Elliott Bay and the Port of Seattle. Tugboats, fireboats, Washington State ferries, and some of the largest cargo vessels in the world can be seen, along with the cruise ships and other vessels that work in and around Puget Sound. 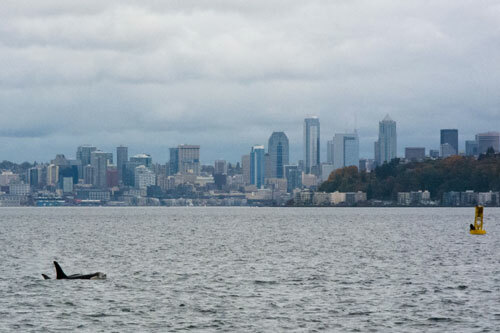 Once underway, we pass by the Alki neighborhood, which is historically significant to the founding of Seattle. I also like to point out the location of some village sites and other locations important to the Coast Salish tribes from the area. As we pass Alki point, there is an inland class lighthouse that lines up beautifully with Mount Rainier for an iconic photo opportunity to represent our beautiful area. After we cross into the shipping lanes, the beauty of Blake Island comes into view as we approach Tillicum Village. Quinn: The Salish Sea is brimming with impressive biodiversity, and it's not too uncommon to see bald eagles, harbor porpoises, or the world's largest species of jellyfish—the lion's mane—on the cruise. 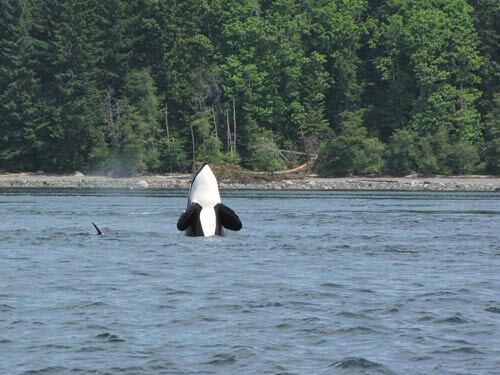 We are occasionally lucky enough to cross paths with larger cetaceans on the journey; I've seen resident and transient orcas, pacific white-sided dolphins, gray whales and a mink in this stretch of Puget Sound. The island itself is a great place for bird watching, thanks in large part to the efforts of Cannie Trimble in the late nineteen-teens. Bald eagles, osprey, king fishers, pileated woodpeckers and great blue heron are just a few of the larger birds. There's also a herd of black-tailed deer, minks, and an infamously bold population of photogenic raccoons. Frank: Blake Island is a 475-sqare-acre state park. A vast array of plant life is to be found on the island. Huckleberries, thimbleberries, and Salmon berries are always fun to find. We also have an interpretive trail with placards to identify species and how they were important to the native people in the area. It is also believed to be the birthplace of Chief Seattle, the man who gave his name to a beautiful city, loved by so many. Also, you can find the remains of the historical Trimble mansion on the island as well. Frank: Ah, the food. Where should I begin? From the minute you step foot on the island, you are greeted with a steamed clam appetizer. 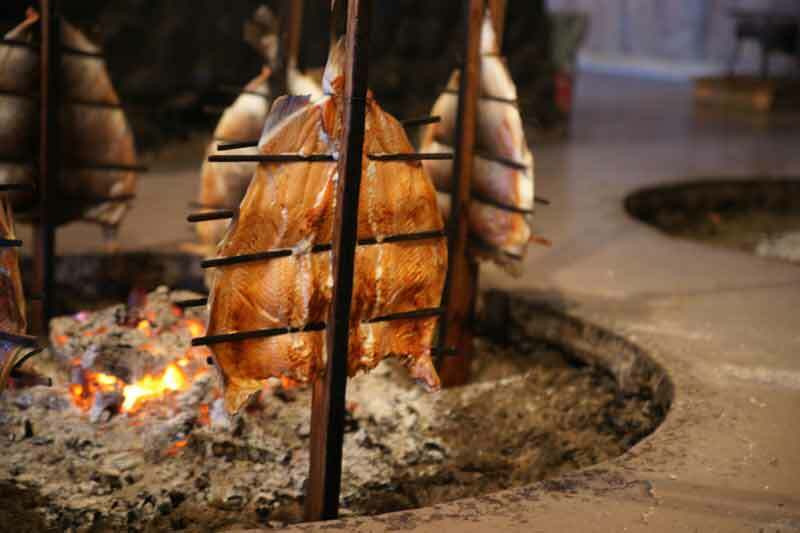 Once you enter the longhouse, you get to witness the fish being pulled off the fires. One of those fish you see will be occupying your plate soon enough! The method of preparation is about 1500 years old. It is a tried and true method that is sure to be one of the best fish you have eaten, no matter where you call home. [It's] cooked over an alder fire to perfection. On our buffet line, we have a number of other options available to you. Salads, fruits, polenta with a mushroom ragu, rice and of course our stew made with venison, bison and beef. If you have been to Tillicum Village before, you are sure to remember our bread. Made especially for the island, with just a touch of molasses to render a slight hint of sweetness. Save room for dessert! An amazing Blackberry crisp rounds out the meal, just as the show begins. 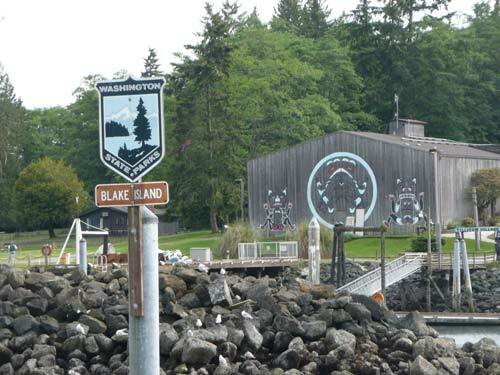 Frank: Blake Island's original name is recorded as "Tah-tsoh." It means bullhead fish. The island was never home to any permanent village sites, but was part of the seasonal rounds that were made during the warmer months to gather supplies for the winter. It is believed that in 1786, during these seasonal rounds, the boy who would grow to be Chief Seattle first drew breath upon the beaches just south of Tillicum Village. Chief Seattle was a member of 2 tribes. His mother was from The Duwamish tribe located in and around the area where modern day Seattle now sits. His father was from The Suquamish tribe. 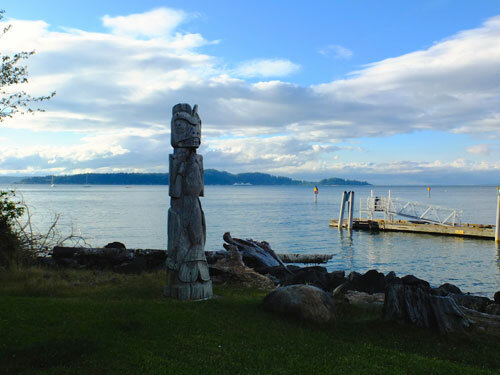 The island is found just to the south of the Suquamish reservation at Port Gamble, and in their territorial waters. 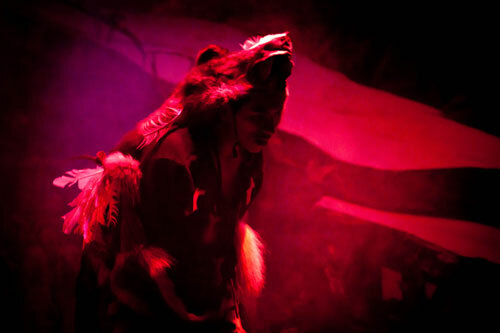 Frank: The show consists of 5 songs and dances from tribes in the area. My favorites are the Ancestral dance from the David family and the Parade of masks. The ancestral dance is an important dance to me, because it beautifully signifies our relationship to our past and obligation to the future with beautiful imagery. The parade of masks is quite stunning due to the use of some of the largest masks from the region. My favorite mask is 6 feet long and weighs 40 pounds. Quinn: Don't try to make it the entire way around the island in one trip! Luckily you can mix-and-match our public tours to spend more time exploring, or even camping on, beautiful Blake Island State Park. Frank: I think most people know the basics. Please don't call anyone chief, none of us on the island hold that title. Also, costume is not correct to describe the clothing worn. The accepted terminology is "regalia." During the show, flash photography is prohibited. We try to encourage guests not to open the doors of the longitude while the performance is occurring. The Do's are easy! Please feel free to applaud for our performers. Please feel free to ask questions, and please have a good time. 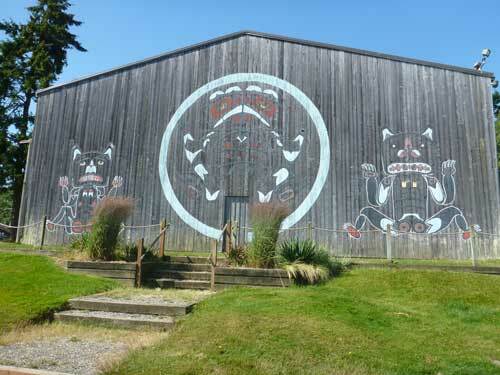 Quinn: Longhouses have traditionally been home to winter ceremonials, gathering communities together in the darkest months to share stories, songs, and dances around the warmth of family and firelight. Quinn: There is a fantastic variety of artists from Washington and the broader Pacific Northwest represented in the gift gallery—find something that speaks to you! Nancy Burgess is a master weaver in the Haida tradition; her awe-inspiring baskets and ceremonial hats are available for purchase, and you may have the opportunity to meet her as she demonstrates this ancient art form. Frank: I have to admit, I am addicted to books. We have a good selection of books pertaining to the cultures in the area. You can choose anything from children's books all the way up to some pretty academic approaches to the topics. 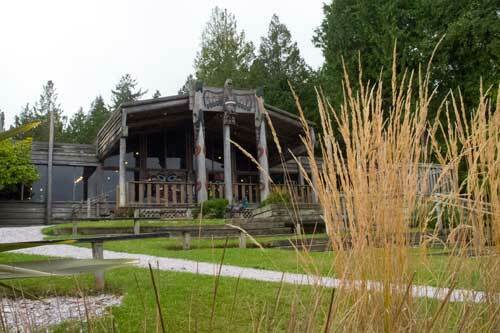 Just a few types of topics covered are cookbooks, art, canoes, the cedar tree and its uses, and mythological stories. I do have to say I also like the t-shirts and sweatshirts adorned with artwork from the tribes. These are pretty fun souvenirs for people to remember their time here with us. The Tillicum Village Experience is run on a seasonal basis. Please check the schedule here. It is offered to CityPASS holders at a discounted rate. Adults and seniors, $60 (regularly $89); ages 4-12, $23 (regularly $32); ages 3 and under, free.